An environmental group’s argument that the State’s key climate plan impinges on citizens’ human rights should be discarded as it does not have the legal standing to do so, the High Court heard today. The court is currently hearing a landmark climate case brought by Friends of the Irish Environment (FiE) as the group – under the Climate Case Ireland moniker – seeks an order quashing the National Mitigation Plan. FiE argues that the Plan is not designed to achieve the substantial reductions needed to halt rising emissions and is thus a clear breach of Irish citizens’ constitutional right to life. Speaking this afternoon on behalf of the State, Rory Mulcahy SC said that that as FiE is a company limited by guarantee it does not have locus standi to “assert an entitlement to those rights”. “Insofar as they are seeking to assert a breach of human rights, it is absolutely clear that they are seeking to assert a breach of others’ human rights,” he said. While accepting that FiE is a “bona fide organisation” and “not a crank”, Mr Mulcahy argued that it is not generally permissible to present another person’s case in the Irish courts. “That’s not impossible in the Irish legal system but it is unusual, it is exceptional and, in my submission, the applicant doesn’t fail within the exceptions,” he said. 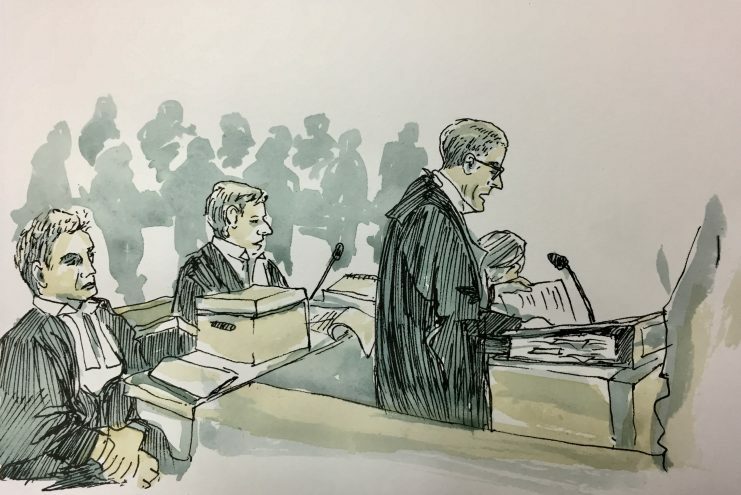 Drawing from yesterday’s Climate Case Ireland hearing in the Court room. . Ireland ‘completely off course’ in meeting carbon reduction targets – court told . #climatecaseireland #friendsoftheirishenvironment. Niamh Hyland SC, also counsel for the State, has earlier argued that any decision obliging the State to ramp up emissions targets under a revised Plan would have a fundamental impact on Irish society. FiE’s preferred emissions targets would leave the state with “very challenging deep cuts”, Ms Hyland said and would lead to “extreme alterations” to our way of life. She said that FiE is essentially seeking a judgement that would see the judiciary “put straight into the position of the executive… telling the state what reduction is to be achieved by a particular date”. On Tuesday, counsel for FiE Eoin McCullough SC said that this line of argument is a “false premise that lies right through the State’s submissions”. Mr McCullough said that the applicant does not seek to prescribe the types of emissions reductions that must be made nor does it seek a declaration that the State must bring about a certain level of emissions reductions. “[The applicant] doesn’t pretend to put forward what the State describes as it’s prescribed policy, rather it simply says… the plan is not calculated to achieve substantial reductions [and] is in breach of the Constitution and of the European Convention on Human Rights,” Mr McCullough said.